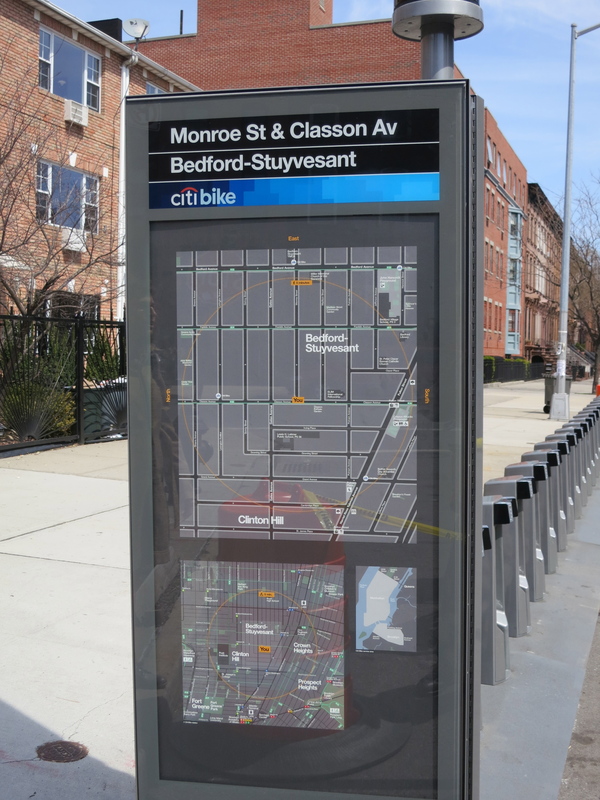 Citi Bike (stations) come to Brooklyn! 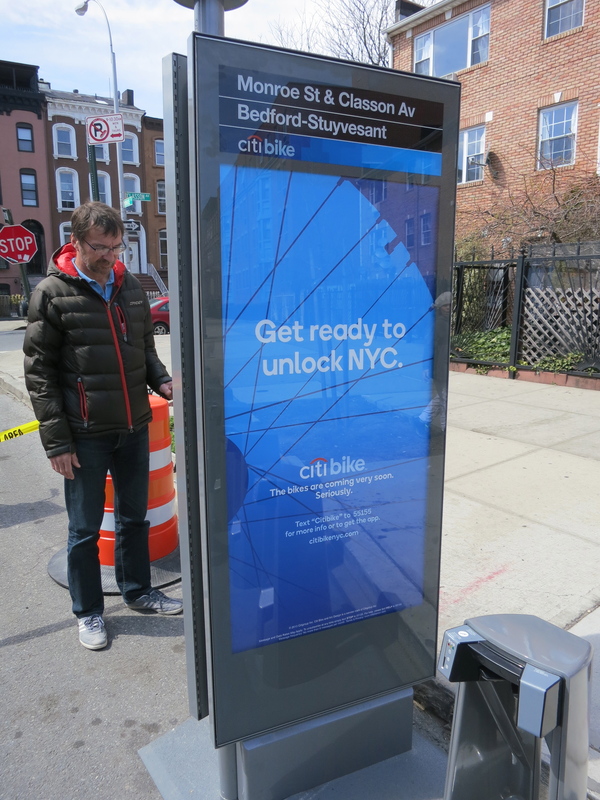 On Saturday, Transportation Alternative’s Paul Steely White nearly broke the Internet when he posted the first picture of a Citi Bike station on a New York City street. 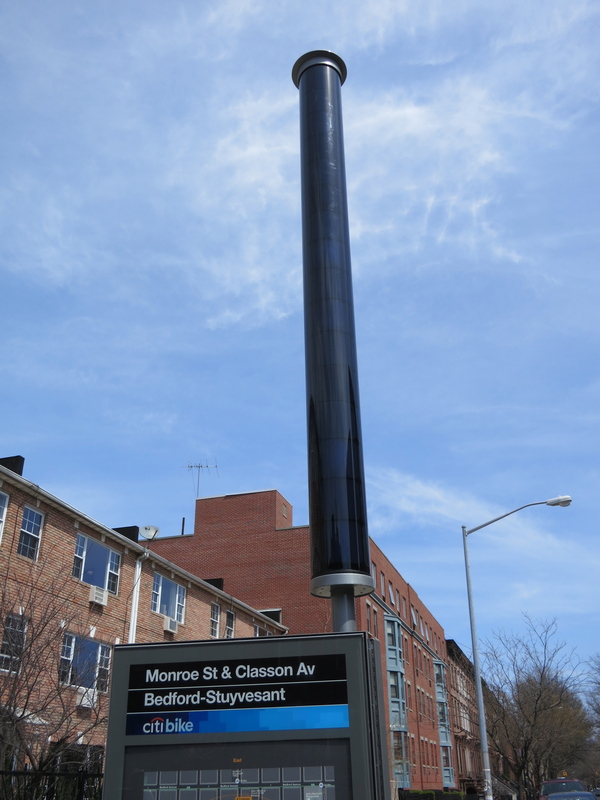 Before this weekend the only other sightings were confined to the Brooklyn Navy Yard where a small test program was being conducted, and many people, myself included, were more than relieved to see Paul’s picture of a station on Monroe Street and Classon Ave in Bed-Stuy. Citi Bike is finally on its way. As you can see, there’s a very prominent sign on the docking station’s kiosk displaying the station’s street and neighborhood location, printed in a font that should be familiar to any regular mass transit user. Functioning largely as a wayfinding map, this side of the kiosk has a small CitiBank logo, and the impression I got when I rode up on the station was that it fit into the overall feel of a typical New York City street environment, even a residential one. This is the station’s solar pole, allowing the docking station to exist off-the-grid. 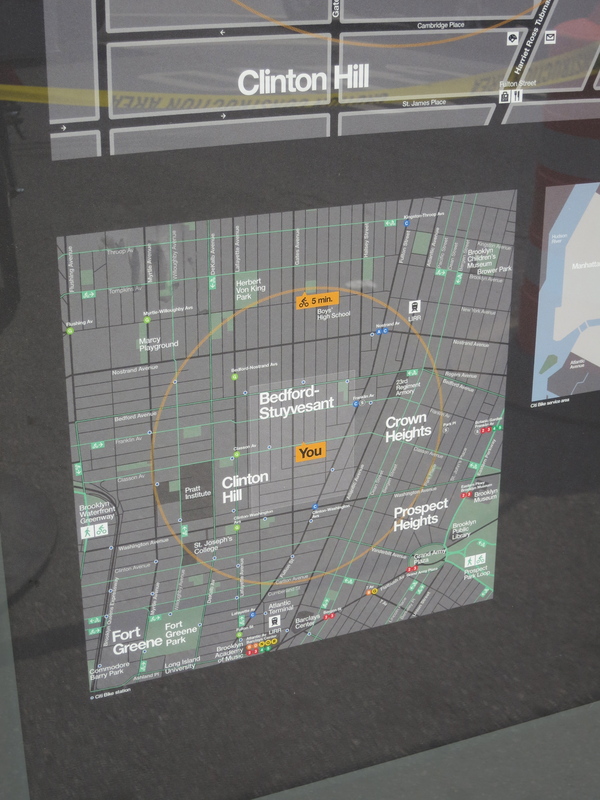 Above, a close-up view of the wayfinding map. One nice thing about these is that the maps are oriented in the direction one faces while reading it, rather than in a typical fashion with north at the top. You can more or less crane your head around the station and see Franklin Ave at the end of the block or turn around and see Classon Ave directly behind you, just as it is on the map. Think of a tourist who has to read a map upside down as he’s walking south in Manhattan and you’ll know how helpful this kind of layout can be for the geographically challenged. This particular station has 19 docks and is located in the parking lane of the street. (The bikes are coming soon, presumably after a much larger number of stations are in place closer to the launch date in May.) For now, traffic barrels and yellow tape block off the area around the station to discourage motorists from parking next to the empty docks. 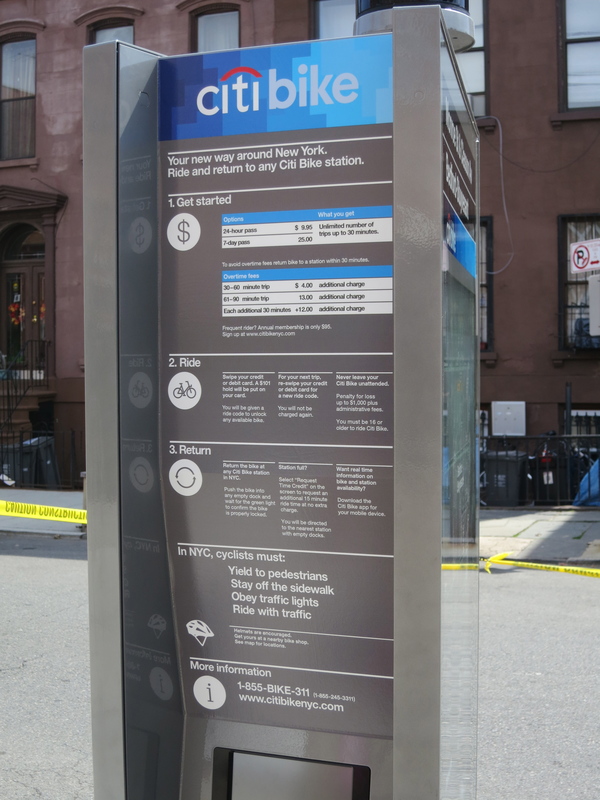 The prices and fees are no surprise, but seeing them listed on the street really reinforces the idea that Citi Bike won’t compete with longer tourist rentals; a ride of just over one hour would cost $22.95 $26.95. All the other policies are clearly laid out, and while I’m sure we’ll read a few stories in the Post — or Gothamist! — about some poor sap who mistakenly took out a Citi Bike out for a five-hour leisure ride from the Battery to the Little Red Lighthouse with a picnic in between, that rider won’t be able to say he wasn’t warned. And don’t leave the bike leaning against a street sign while you run in to a bodega to grab a bottle of water. While theft hasn’t been an issue with other bicycle sharing systems, you’ll be out “up to $1000 plus administrative fees” if the bike is stolen. The rules of the road are spelled out very clearly on the kiosk. If you think about it, this will arguably be the best and most direct communication about street etiquette to people on bikes in years. I’m of the opinion that courtesy to others trumps fidelity to the law, so it’s especially nice to see that “Yield to pedestrians” is the first idea on the list. The last one, “Ride with traffic,” strikes me as leaving a bit to be desired, since it could be interpreted by some to mean, “Don’t ride on the sidewalk or on pedestrian pathways, ride where all the cars are instead.” Perhaps “Ride in the same direction of traffic” was too cumbersome, but don’t expect this last rule to stop salmon any time soon. 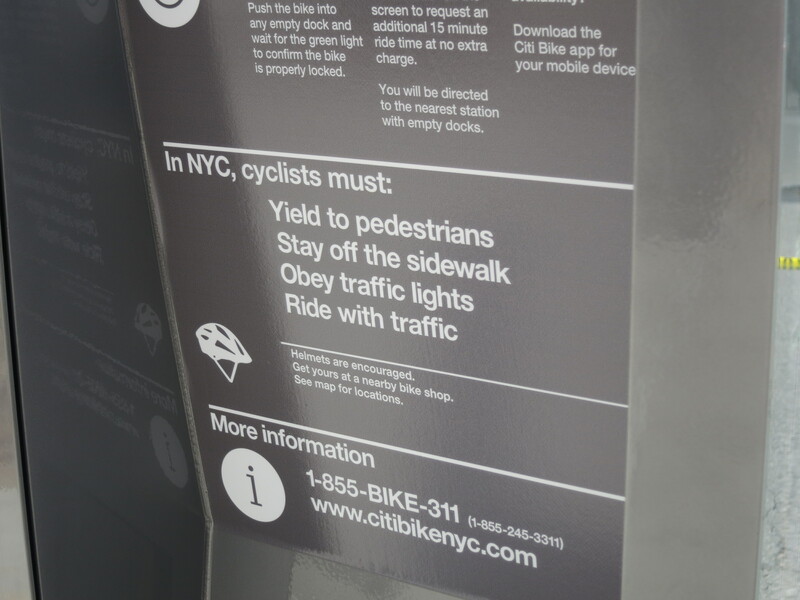 Users are told that “Helmets are encouraged,” and instructed to visit nearby bike shops. Considering how industrious New Yorkers can be, however, I’m guessing it won’t be long before the same guys who pop up with umbrellas every time there’s the threat of rain set up helmet concessions near Citi Bike stations in popular tourist areas as well. 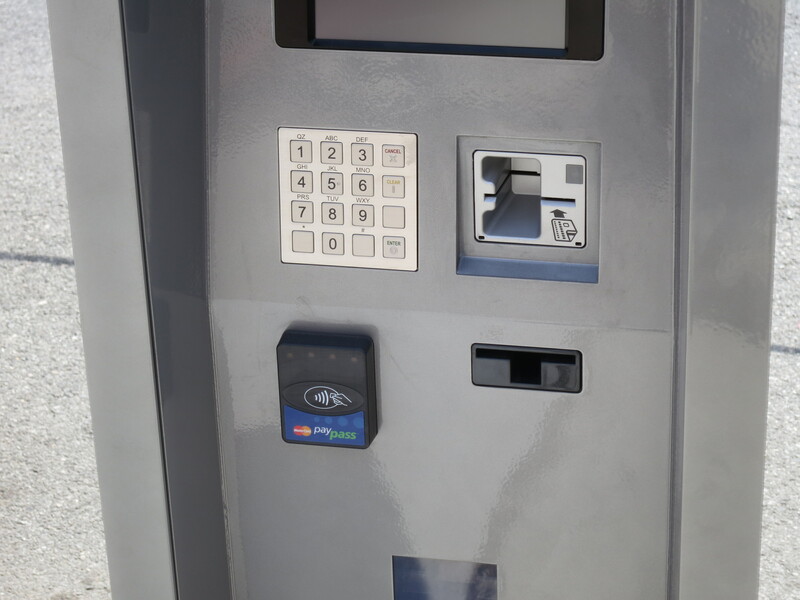 MasterCard is the “Preferred Payment Sponsor” of CitiBike, so there’s PayPass branding under the keypad. The station attracted a fair amount of curiosity while I was there on Sunday and I wasn’t the only one out snapping pictures. The young girl above was having a great time using the docks as a curbside playground. Isn’t it amazing how a bike share station can make people engage with the street in a different way than a parked car? A close-up of a dock. Bikes have a triangular locking mechanism on the front which fits into the dock. Here’s a view of the station on the curbside. 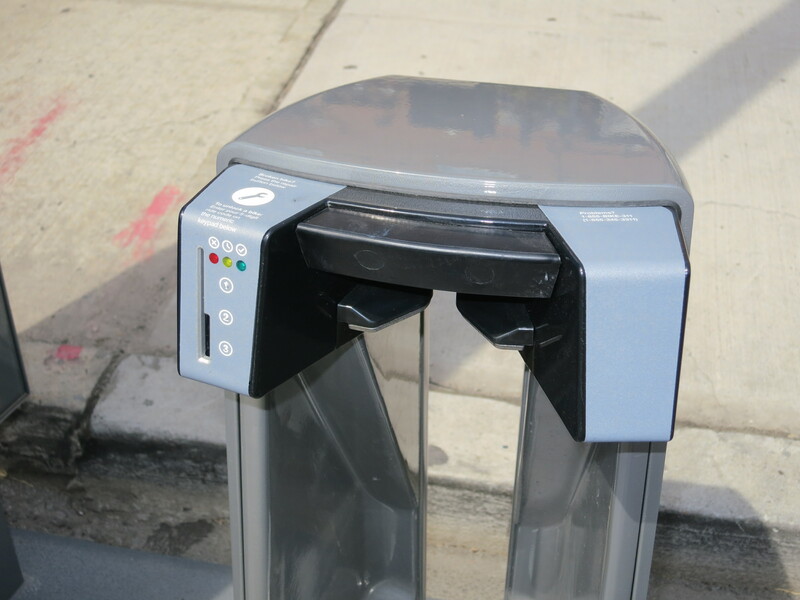 The gap between the station and the curb might be problematic as it could collect trash. 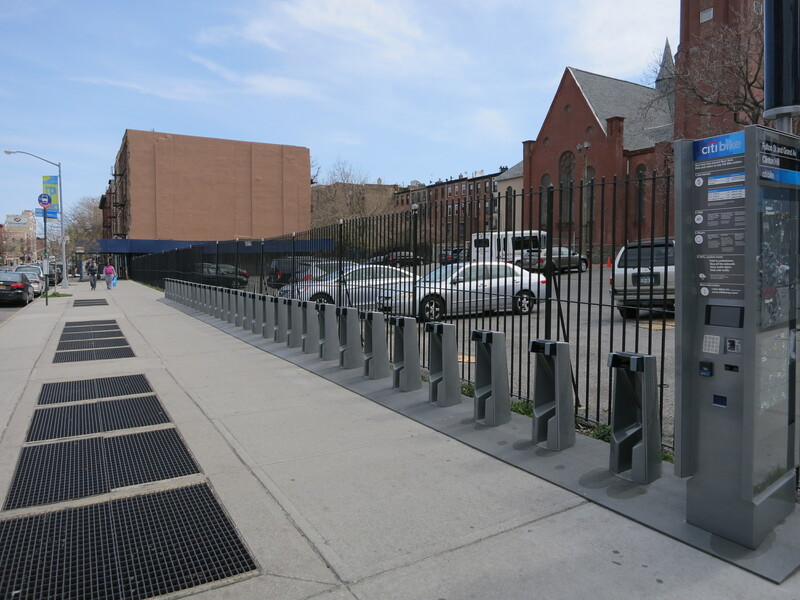 I know Capital Bike Share and Hubway are meticulous when it comes to upkeep, but expect Citi Bike crews to be busy depending on how and where stations are placed. I happened upon another station at Fulton Street and Grand Avenue. This one is located on the sidewalk and has 31 docks. It’s also perfectly placed right next to a bus stop. Hop off of a bus, grab a bike, go home. Or drop off a bike, get on a bus, and go to work. Either way, it’s a perfect illustration of how bike share complements an existing transit system. “Soon a lot more people will have a key to the city,” written against the silhouette of a bicycle wheel, seems like an acknowledgment to something regular users of bicycles already know. 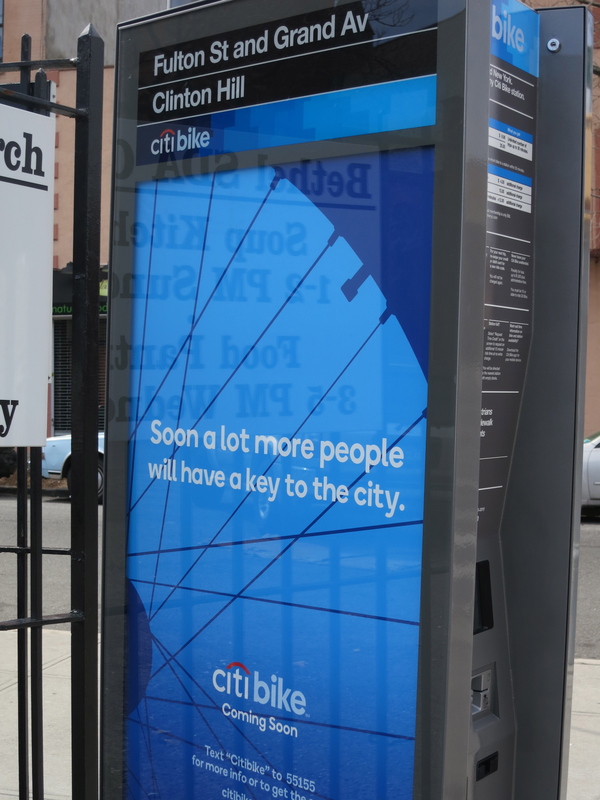 It’s also a sign that Citi Bike’s marketing will tend toward the positive, which is always a good idea. Just like at Classon and Monroe, curious passers-by take in the new street furniture. 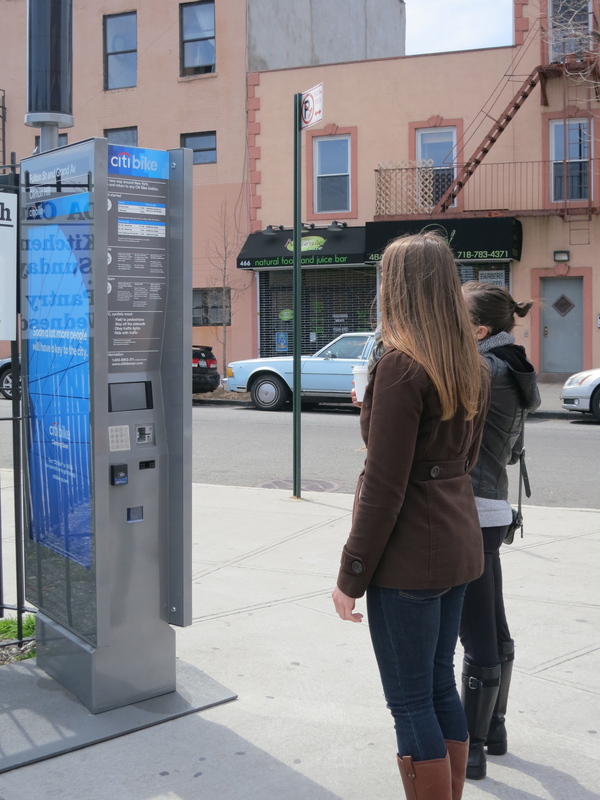 More and more stations will be added as we near Citi Bike’s May launch and it will be interesting to see how it all plays out when the switch if flipped on the whole system, especially when stations are placed in more prominent or iconic New York locations. 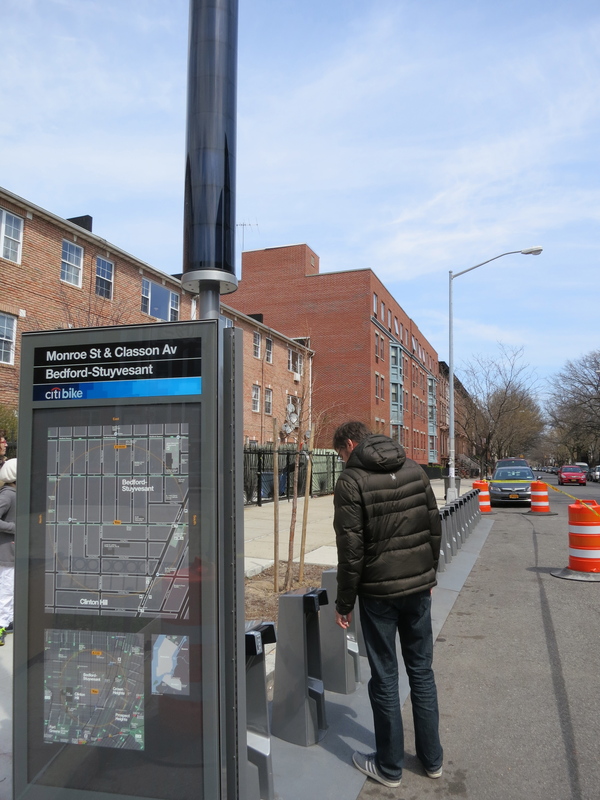 For now we’ll just have to revel in the excitement that has already greeted these first stations’ appearance in Brooklyn. Excellent write-up! Reading this makes me excited to Citi Bike all around NYC during my next trip. 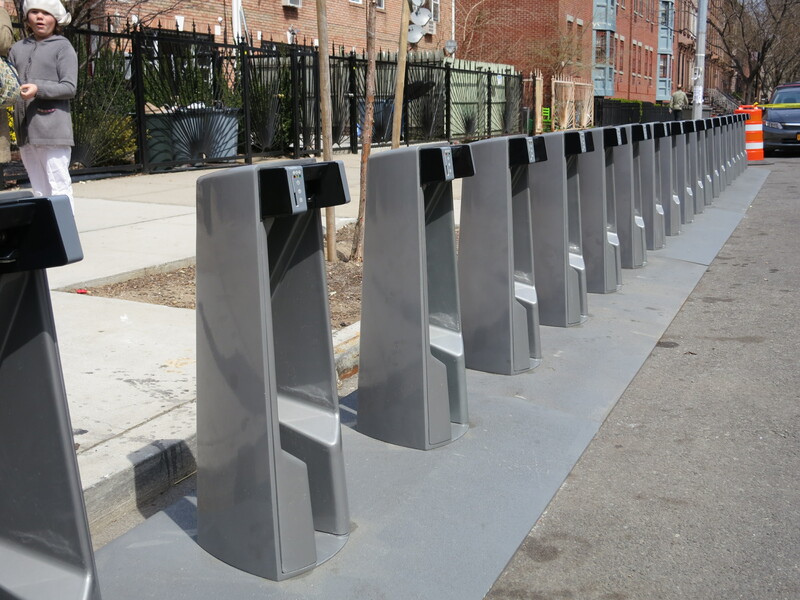 After seeing how amazing Velib is in Paris, I’m super optimistic about the positive changes bike share will bring to New York and Chicago (which is supposed to be up and running by late spring). Dottie, I hope you will venture out of the relatively small footprint of the Citi Bike area during your trip; “all around” is kind of an exaggeration. I hope the program is successful and can be expanded throughout the five boroughs. Thanks, Dottie! When you visit please let me know. Happy to show you around! Dear God. Are these atrocities permanent? They set up comes right outside my apt last night (with a Tuesday tow away sign – posted Monday at 730pm, classy). Apparently it will be a 23 bike station, which takes up how many already sought after parking spots!? I’ve been biking in NYC for years, but find this idea altogether stupid. You’re kidding, right? Anyone with concerns about the environment, obesity, noise and traffic will welcome Bike Share to NY. Programs like these have totally transformed DC, Montreal and countless other cities already – encouraging bike use in a way no other program can (including bike lanes). The more bikes we see, the more comfortable people will be riding their own bikes around town. This is a HUGE leap forward for our great city. 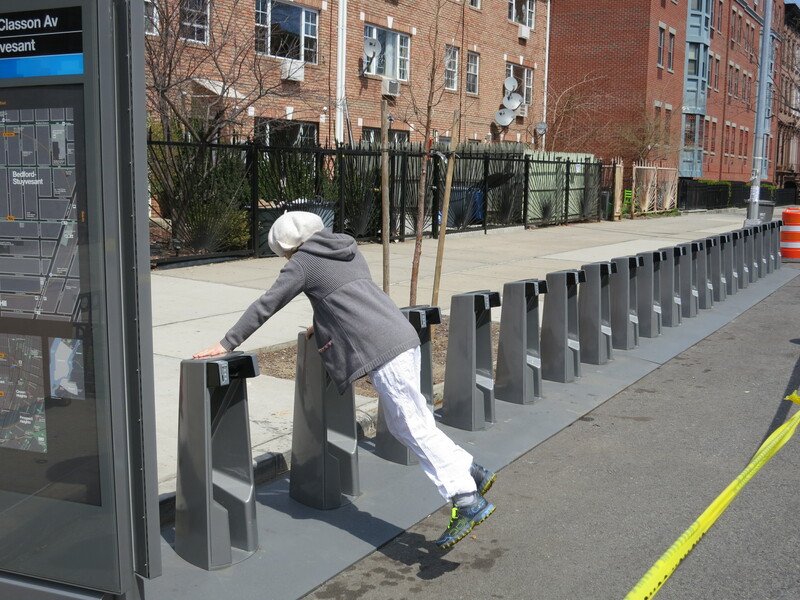 The racks look better with bikes in them, so stand by and get ready for big positive changes to finally come to NYC. I think you must be joking! So you are going to have access to bikes for YOU and your friends directly in front of your place and you are mad? What am I missing here? – So 23 bikes (vehicles) can fit in the space typically occupied by 3 cars (vehicles). Sounds like a good trade-off to me. – No one, cyclist or otherwise, will be forced to join or love bike share. There are a lot of things I find “stupid” about NYC, but these things tend not to agitate me all that much because, hey, that’s life in the big city. – Only one day’s notice to move your car seems unfair. On that we agree. For the record, I’m not joking. I do have legitimate concerns about the environment, obesity, noise and traffic – but I hardly find shelling out stations of overpriced bicycle rentals throughout the city a realistic solution. They are too expensive and the time limit is too short to actually make a noticable difference. I live in Fort Greene, and personally doubt any of my neighbors in the housing projects will use these (despite the discount). Nor any of the parents with young children. Tourists dont really come as north as I live either, as it’s mainly residential and far enough from the subway to not really have a reason to. Those of us in this neighborhood who think biking is a good idea – have bikes, and ride them already. We are the ones going over the bridges to get to work on a regular basis. Not taking a 30 minute ride to check out the Navy Yard. More people owning and using bicycles is what will really change things. I agree that the overall idea is great, and may help the city somewhat. However I fear these bicycles will mostly be used by tourists and/or people who dont know nor follow bicycle laws, which will cause more trouble than good. And if 23 bikes = only 3 car spaces, then I’ll cool down. Currently they have significantly more (10 on each side of the street) coned off with “no parking” signs. My main gripe is simply the location. I often work late hours. I have a car. I also have a newborn daughter. Taking away already hard to get parking spaces (that happen to be directly in front of my apartment) will only make my Thursday nights more difficult to find a spot, which will result in me and my wife needing to walk much farther to get to whatever parking spot I find in order, for example, for my recovering wife to take my daughter to a doctors appointment. This does not make for a happy daddy. On a lighter note – no cars have been towed yet, and there are still a handful parked in the “no parking” area. We’ll see how long they last. Further to the above – we have a 10-12 ft wide sidewalk directly adjacent to the proposed parking lane location of the bicycle rack. Why note put it on the sidewalk!? And they are outside on a flat bed truck. 23 bike racks = many more than 3 parking spaces, FYI. Lucas, my bet is that DOT needs to block off more parking to set up the stations than they will need once the stations are operational. They have to be able to put the stations in place and access them without damaging people’s cars. My heart doesn’t exactly bleed for you, and the loss of your precious parking spot. I can’t afford a car. Many, many parents, dare I say most, in the city don’t own a car, and seem to get by. And if you’re parking in the street, the city is subsidizing storage for your luxury (and in so many other ways). So yeah, I think 23 bike stations vs. three parking spaces is a value proposition. And apparently you’re willing to inconvenience a host of pedestrians on the sidewalk, and force them to cross paths with the bike users, rather than three drivers? Lucas, I have a three-year-old daughter and a newborn son. I wouldn’t want to dismiss another person’s specific concerns or needs, but I am able to cope without a car. When I’ve had to rent one – such as when I brought my son home from the hospital – it didn’t seem like a big deal to park somewhere other than right in front of my building. Rather than getting upset at bicycles, I always wonder why the drivers who truly depend on their cars don’t get upset at other drivers for taking valuable parking. Many people store their cars on the street for days or weeks on ends, depending on ASP schedules, and seem to only move them for recreational or discretionary trips. Imagine how many people would give up their cars if the cost of parking a vehicle they use only on weekends wasn’t free! And to challenge you just a little bit more — and seriously, I do appreciate you engaging here — I’m not sure we should design our roadways and give away precious NYC real estate just to make one person’s Thursday nights a little easier. In a city as big as New York there’s absolutely no way to accommodate every driver’s specific needs. Let’s be clear, I’m not actually upset about the bicycles. As stated before, in theory I think they’re a great idea. I’m more irked by the overall inconsiderateness of the whole process. 1. That they put up towing signs less than 24 hours before the cars were supposed to move. Yes cars were ticketed and towed. I fall into the category of someone who parks their car and doesnt return to it for a few days. If it’s in a location I dont pass when coming home, I would never know. That’s $300 of inconsiderateness per car towed to start with. 2. That bike rack locations must engulf automobile parking locations. Yes this city is compact, but there are plenty of locations in this neighborhood, our extra wide sidewalk included, that these could have been alternatively located. Yes having a car in this city is a luxury (Wil, my mom gave me her used car when she got a new one so that we could have wheels for when the baby came), but I do not understand why it has to be an either-or instead of a both-and. Brooklyn, I get equally upset at the number of motorists when I come home at 1am and spend an hour looking for a parking spot, sometimes a 30 minute walk away. Adding bicycle racks is not going to solve the number of cars on the street however. And I’m not advocating for the city meeting my each and every need. I’m just upset because this seems like a poorly designed “solution” to a cool idea with not much space. Again, I’m skeptical to how successful this will be anyway, specifically in my neighborhood, in this location. If the goal is seriously to help the environment, obesity, noise, and traffic, why not purchase bicycles and safe storage locations for anyone who takes a bike safety course, instead of dumping a bunch of money into space hogging bike racks that may or may not successfully be rented. In any case, they’re nearly installed now, so what’s the point of discussing further? It looks like (due to the poor “parking” of these racks) they’ll end up eating a total of 6 car parking spaces. Lovely. Lucas, sorry to hear about your travails with a car and kids- I feel that pain having lived in B’stone Bklyn for 30 years- parking was always a chore and it hasn’t gotten better only progressively more difficult. It was 2 years ago we bit the bullet and took an indoor lot. I love bikes, I love cars, I love mass transit- and we have one of the lowest carbon footprints of all the cities with subways because of the mass transit, not in spite of it… that’s one of the great things about this city. as for the bikes 45 minutes is sinfully stupid- nothing in this city takes 45 minutes- what happened to the hour? Inflation? I hope that gets rescinded and fast. Taxpayers are NOT paying for the system, Citi is… For this they get logos. Would you be happier if they were MetLife Bikes? Also, last I checked we actually made money off the bank bailout. Why would stations “outside housing projects” be more likely to get “totally trashed” than anywhere else? Please keep the comments civil. Thanks. Great coverage! But how do you count “a ride of just over one hour would cost $22.95”? im with bmdesignhki: not sure where the 22.95 comes from…? and what are the annual fees? – $9.95 for the 24-hour pass. – That pass entitles you to take unlimited 30-minute rides in a 24-hour period without incurring additional fees. So if you take, say, 10 rides throughout the day of no more than 30 minutes each, you’d pay nothing other than that first $9.95. Just return each bike to a docking station before your 30 minutes are up and you’re good. – If you happened to ride one bike for between 30 minutes and one hour straight — that is, never stopping or re-docking the bike at another station — you’d incur your first “overtime fee of $4.00. – If you kept riding that same bike, another fee would kick in after you hit one hour. That fee is $13.00. $9.95 pass + $4 overtime fee + $13 fee = $26.95. You can see how that kind of quickly escalating price might encourage leisure riders to go to a bike rental shop instead. Citi Bike will be great for A-to-B journeys, in the same way one might use a taxi for a quick cross-town trip but not for a longer scenic drive. There are ways to avoid the fees, of course. Boston’s Hubway has a 30 minute limit but I used it for a trip that I knew would take about 45 minutes. I picked up a bike, rode toward where I needed to go for about 25 minutes, docked the bike and then grabbed another bike for the remaining 20 minutes. Two trips, both under 30 minutes, and no additional fees beyond the day pass cost. An annual membership is $95 and comes with unlimited 45-minute trips, instead of the 30 allotted to 24-hour and 7-day passes. Overtime fees are also slightly different. Hope that helps answer the questions! I can’t wait for the bikes to come. This is going to be great! Anything that encourages cycling and discourages cars is good. Cars get subsidised parking in one the most expensive cities in the world so replacing 3 cars with 23 bikes makes a lot of sense. NYC can not take any more cars. We need more transit and biking; that is the only way people will be able to get around. Cars get lots of road space on the street that people and bikes should get. Cars cause pollution, noise pollution, traffic, and in general make the city less livable. GO BIKES!!!! 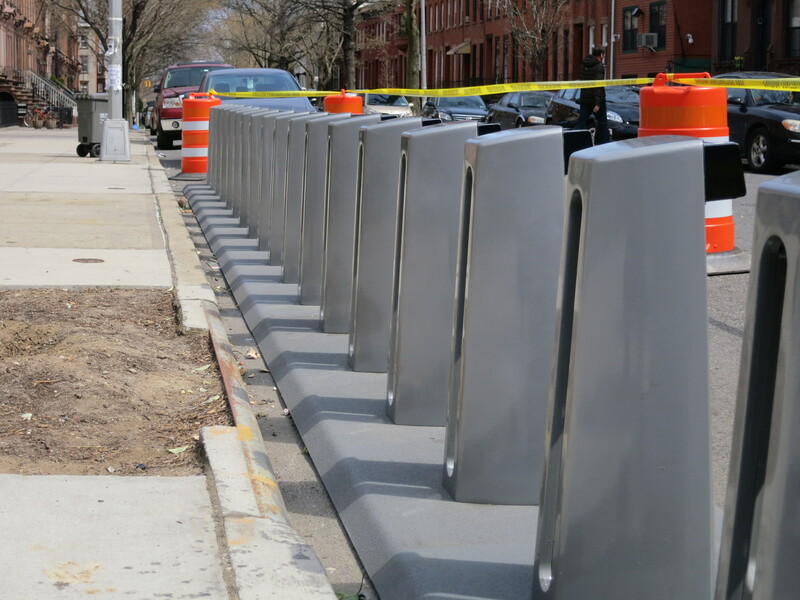 Bike share + lanes has transformed Boston. I counted 42 bikes in 8 minutes crossing the Charles River (Cambridge to Boston) on Mass. Ave. during rush hour a few weeks ago. 7 were hubway bikes. That’s a rate of 315 an hour. On an unlovely early spring morning: 49 degrees & cloudy & windy. I have my own bike, but when I worked in town last year, I used the hubway bikes for short jaunts quite regularly when I’d taken public transportation instead of biking in from the ‘burbs. Don’t listen to the naysayers. Bike share is a big, big win. Soon, the only complaints will be about bikes and stations not meeting demand. Thanks, Steve! I’ve used Hubway a few times – actually enough to make a membership worth it for me – and agree with you 100%. It took me to places I never would have gone before, and I say that as a former Bostonian! It’s good for the city and good for business.